I have been reading your book recently and have found some of it really useful. I have been wrestling with the issue of gossip for some time and it has given me much clarity on certain things. But I have a question that I hope you won't mind answering and it has to do with the only caveat to gossiping - warning others. In your opening chapter (p.28) you say that there are times when we have to talk about people who are not present and even share bad things about them. You say that this falls in line with the biblical principle of 'warning others' which will be discussed later in chapter 5. In chapter 5, section 3, under the subheading 'exception: warnings'(pp. 85-86) you say that there are times when we HAVE to talk about someone else without them being present in order to warn others. Although you again state that warning others is a biblical principle you fail to quote the Bible anywhere to back this up. Instead you illustrate the point with a story of a friend of yours, John, who warns his friend, Ryan, about a drug taking prospective boyfriend of Ryan's daughter. But the story is massively flawed. Your friend John is already acting on second hand information (some seemingly credible information - from somebody else?) which he then shares with his friend Ryan. He is obviously not 100% sure about the information he is passing on because he says that it might turn out to be a misunderstanding and he knows that the character of Michael is on the whole good. Rather than being a good example of warning others this is a good example of gossip masquerading as warning. The biblical principle would surely have been for John to go to Michael. He obviously knows him and he has an opportunity to confront him about his sin thus allowing Micheal to repent, if at all Michael needs to do this as the info doesn't sound compelling. If Michael fails to change his ways then ideally John brings somebody else in to challenge Michael together, and failing that it is either brought before the church or if Michael isn't a Christian then he is told that Ryan and his daughter will now be informed about his behaviour. That is the only pattern of talking about others to warn them that I see in the Bible (Matthew 18:15-17). The details of the story that you relay would only be applicable as the final stage when all other options have been exhausted and there is no repentance. And this should only be done after John is 100% sure of the information about Michael. I would be really interested to know what the biblical principle of warning others that you implicitly refer to is, because at the moment the only guiding principle you offer is to treat others as you would want to be treated yourself. Thanks for your note and your very good, well-stated question. This is a busy season, and I don't have the time right now to respond as your question deserves. I look forward to further interaction soon. Thanks for responding so quickly Matt. I look forward to your reply and hope that you have a great Christmas season. Just a quick note to let you know I haven't forgotten about you! I'm sorry that it's already been over a month since you sent your question. I hope to have some substantive thoughts for you next week. If not then, then the first full week of February. Thanks Matt, I look forward to your reply when you have time. Thank you for your patience! I’m embarrassed that it has taken 3 months to get back to you. I sure didn’t expect that. Life has been way too full lately, and I haven’t had enough mental bandwidth to interact substantively with your excellent question. What you ask about–warning people of potential danger from others without simultaneously gossiping about those others–can be a thorny subject. As you can tell from the many qualifications I make in that short section you reference in my book, I didn’t want in any way to encourage people to rationalize or excuse gossip under the guise of warning others. And yet, it is right when you love someone to warn them of likely dangers you can see facing them. There may not be a direct New Covenant command to warn others of potential danger from others, but there are many positive examples of godly people doing so in both testaments. For example, Jonathan warned his friend David of Saul’s intent to kill him (1 Sam 19 & 20). Ezekiel was told to set watchmen for Israel whose solemn job was to warn the people of coming danger from others (Ezekiel 33). In the Proverbs, Solomon and company warned their young disciples to beware of certain types of bad actors–the fool, the hot-tempered man, the wayward wife. Our Lord Jesus told His disciples to be on their guard against men with bad designs for them (Matt 10:17, Mar 13:9) and also against the infectious negative teachings and tendencies of the Pharisees and the Sadducees (Matt 16:6, Luke 12:1). The apostle Paul warned the Ephesian elders that some men from their own group would eventually betray the faith and try to lead others astray (Acts 20:29-31). And Paul told his followers to watch out for particular people (not just types of people) whom he knew to be dangerous. For example, he wrote to Timothy, “Alexander the metalworker did me a great deal of harm. The Lord will repay him for what he has done. You too should be on your guard against him, because he strongly opposed our message” (2 Timothy 4:14-15). Those are the kind of biblical data points about warnings I was alluding to in my book (and I wish I had included some of them, too, as it might have strengthened the argument). Of course, the sticking point is that in all of these examples the intelligence is 100%, the information is firsthand, and each case is “slam-dunk.” But what should a disciple do when they believe the threat is credible and the danger to their loved one is real, but they can’t be absolutely sure? Here, I think the answer is, “It depends.” I certainly don’t think people should go off half-cocked. The whole point of my book is to be careful with other people’s reputations. We should all work to verify what we think we know and to honestly examine our motivations before we share negative information about someone else with someone whom we think they might harm. I think your suggestion is good, that in my story, John should talk directly with Michael about what he has heard. At times there may be legitimate factors that keep that from occurring, but the impulse is always good. In fact, I encourage that kind of directness in the section immediately preceding the one we’re discussing. Especially in matters of personal conflict, Amy Carmichael’s rule of “never about, always to” is exceedingly wise. And yet I don’t know if John had to talk to Michael before talking with Ryan. It is a judgment call that calls for discernment. There may be many complicating factors, including the nature of John’s relationship with Michael (they were acquaintances, not necessarily close friends or fellow members of a church). I do know that he thought the information was credible enough that he would have wanted to be told it himself. I can’t remember all of the details now at this point, but for the sake of argument, let’s assume the information he had came from a firsthand source–someone directly involved, a police report, or something like that. If that was the case, I’m not sure what further level of due diligence I should counsel John to pursue before providing that warning to Ryan other than to advise John to pray about it and to do the level of due diligence he would want done for himself in a similar situation. At the same time, it would be good for me to help John think through whether or not, and when or how, he should go to Michael as well with his concerns. The reason I included the story was not to give an escape hatch so that we could gossip after all, but to provide a messy story from real life and to show how someone could be sharing bad news about someone not present out of a good heart so as not to be sinning as they did so. Perhaps I should have used a more straightforward case to make my point. Unfortunately, real life provides many untidy situations where the righteous path isn’t always as clear as I would like it to be. Let me offer a different example from the messiness of everyday life. I am a proud alum of the Moody Bible Institute in Chicago. The education I gained there from 1991-1995 has profoundly shaped my life and ministry. The faculty and staff at MBI taught me the Bible and did a great deal to mold me into a disciple of Jesus Christ. In fact, I learned to love and completely trust the Bible as my ultimate authority. I also learned so much about a biblical view of human dignity and how to lovingly relate to people of different races and ethnicities. So imagine my surprise when I recently began hearing both stories of theological drift away from biblical inerrancy in the faculty and charges of racial animosity on campus. The president and his top aide just resigned. What is going on? Now, I want to suspend judgment and have a wait-and-see approach to these matters. I certainly don’t have all of the facts and don’t sit where I have a perspective to make comprehensive conclusions. But what if someone asks me if their son or daughter ought to go to Moody as a student? My answer to that question has been to research the publicly available facts (not just allegations) from reliable sources and to provide as balanced and nuanced account as I can to people who ask my opinion. In this situation, I am not able to go directly to Moody and get everything nailed down before providing some cautions to families with graduating seniors. That doesn’t let me off the hook of loving Moody as I’d want to be loved if I were in charge over there. But I’m also not free to ignore the information I have for the families with prospective students. That’s why I appeal to Jesus’ Golden Rule as the guiding principle in these kinds of situations. You bring up Matthew 18. My sense is that Matthew 18 directly addresses situations where the sin being discussed is a personal one between Christian brothers. Most translations say, “If your brother sins against you go and show him his fault,” though I understand there is a textual question about whether the words “against you” are in the original text, the context seems to bear out that particular kind of situation (ex. “just between the two of you”). So, while the pattern of keeping the circle as small as possible at first and being direct with your confrontation is always worth keeping in mind (and I encourage following it in chapter 8, pgs. 129-132, for personal offenses) as a general guideline, I don’t think our Lord’s teaching in Matthew 18 is given as formal steps to be followed in every situation where someone’s sin might need to be reported to others it might affect. 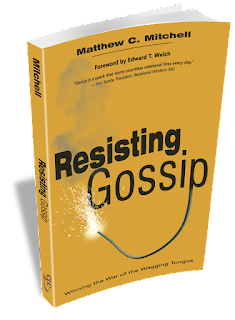 I hope this helps you to see where I am coming from in that section of Resisting Gossip. I don’t want to provide a backdoor for sinful gossip, but I do want to love my neighbor as I love myself and warn them to beware people who could do them harm.